We do things differently because your customers deserve better. That’s why we promise to never add artificial preservatives, binders or fillers to any of our foodservice products. We think you’ll agree that the result is a difference you—and your customers—can taste. Use the following information to showcase the unmatched quality and flavor of Jones products on your menu. Using our family’s 130-year-old recipe, our classic breakfast sausages are made with honest ingredients: pork, water, salt, spices, dextrose and sugar. They’re seasoned with our custom spice blend for a savory, authentic flavor you won’t find anywhere else. 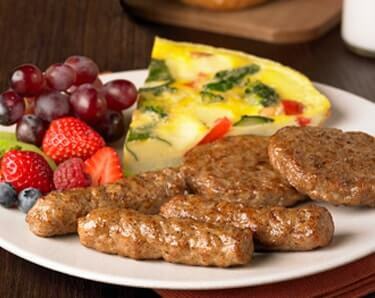 And because we never add binders or fillers, our all-natural sausages are Certified Gluten-Free. You can feel confident that when you purchase a Jones ham, you’re getting a high-quality, naturally smoked product. We use only whole muscles and never freeze our hams, so you get the best texture. 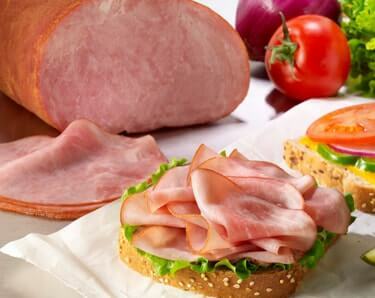 Unlike other companies, we never add ground trimmings to our ham products. And where other companies use liquid smoke to quickly impart flavor, we send our hams to the smokehouse where they take on the unbeatable flavor of real hickory or cherrywood. It’s an authenticity that translates to any menu. 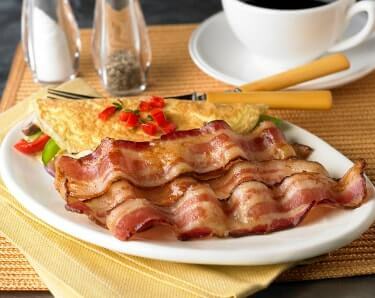 What makes our bacon unlike any other? First, we start with premium, fresh pork bellies. After being smoked with real hickory or cherrywood, we dry age them unlike anyone else. The process can take weeks, which is why other companies don’t do it, but it gives the bacon an undeniable flavor.